1. Send (Stream) your movie from your computer to Apple TV . Any movie that’s playing on your laptop or iMac can be ‘streamed’ to your Apple TV. Once your Apple TV is turned on, a new ‘Airplay’ icon will appear in your menubar. 2. Browse to the movie from Apple TV. To do this you firstly need to turn on ‘Home Sharing’ in iTunes on your computer. If you have some kind of external hard drive or network drive full of movies, all you need to do is drag the movies into iTunes on your laptop or desktop computer and they will appear in the Apple TV menu for that computer. Make sure you turn off the ‘Copy files to iTunes’ box when you do this or it will try to copy all the movies to your computer! Be sure to disable this checkbox before dragging a movie into iTunes or it will copy the entire movie into your iTunes folder. What do you mean by ‘stacking’? Maybe your network is too slow. You might be better off contacting the support forum for MPlayerx. Really? What do you mean that my network is slow? I don’t need mirroring, I need streaming, why streaming is supported by iPhone and iPad, but not supported for MacBook? I need to use 3rd party apps to stream the video with no lags, but I can’t do that with native settings. When Apple will be so kind and will allow users to watch movies using their expensive devices by providing with quality applications. Yes it’s a bit lame. Watch them in Quicktime player and zoom them (Menu item View: Fit to Screen). Or View: Increase Size (Command +). I have an external HDD with movies attached to a new Time Capsule and wish to use my new MacBook Pro to send the movies via Apple TV to my smart television. However I have a problem in that although the movie will play fine on the laptop (using VLC Player) it does not play smoothly on my TV – sound and vision both “stutter” slightly. My home network is fine and uses the Time Capsule as a bridge to wirelessly connect to my laptop. Any ideas on what may be going wrong? My GUESS is that the wifi link to the TV is not as good as it could be (distance? a wall?). 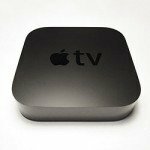 Does airplay work OK from your laptop to the Apple TV? Try connecting from Time Capsule to the Apple TV with an ethernet cable and see if it works. That will show you if it’s a wireless problem. We do this and it works fine. You might possibly have a bad network from the laptop to the Apple TV? In the past few weeks, whenever I start watching any internet video (news clips, youtube vids) on my laptop, the video immediately freezes and mutes the moment I hit AppleTv to stream. AppleTv will only allow me to stream from my mini iPad. Very frustrating and confusing to this ol’ geezer who is about as tech savvy as an ol’ geezer. This endless morphing and upgrading or whatever is going on that keeps making us learn[BUY] a new trick every other week is downright erosive and absolutely exhausting. Beamer App actually solved the problem with lag. Brilliant! Thanks for the tip got everything up and running. Can I use my apple TV to stream a movie from my nas?